Remember Goldilocks and the porridge? One was too hot, one was too cold, and the third… well, you know the rest. Finding the right skincare routine can be a little like that. Sometimes it’s too complicated, and as soon as you get it home, you know you’ll never stick to it. Other times it’s too basic, and you don’t see the improvement you’re looking for. And, frustratingly enough, both options can leave your skin imbalanced—one’s too much, the other’s not enough. It’s already stressful enough finding the just right partner, just right dress, just right venue, and just right date. To take one thing off your list, I’ve broken down your just right skincare routine, right here. Why even bother with a pre-wedding skincare routine? First off, home care applied consistently will make a bigger difference in your skin than self-care blitzes or even sporadic professional facials will. Plus, starting with a good routine means you’ll spend less time tackling breakouts—you’re getting to the root of the problem, and providing a good foundation for any extra treatments you want to work in later. A base of clear skin also means you can wear less makeup on the day of your wedding—no bride wants to get married not looking like herself. The key to building the perfect skincare routine is, much like the recipe for just right porridge I imagine, dependent on ingredients. Stripped down to the basics, a skincare routine should: clean, remove dead skin and extra oil, hydrate, and then seal that moisture in. At its most KonMari, that’s four steps you can do every day to improve your skin. The products you choose in each category will then be tailored to your skin’s particular needs. Of course, there will be extras—serums, masks, SPF—and closer to your big day, you can start working in targeted professional treatments. But for morning and night, let’s start here—below, find a list of expertly curated recommendations for a stress-free skincare routine. Think of this as your base. 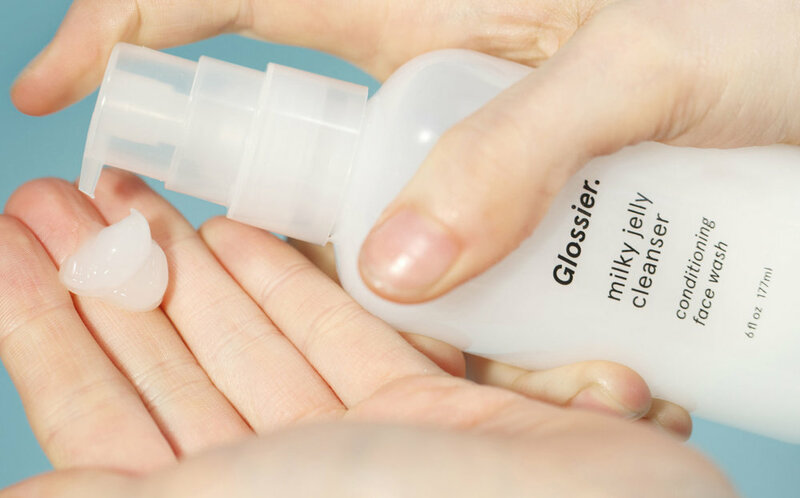 A cleanser has one purpose, and it’s literally in the name—to cleanse. It’s not made to penetrate, and it’s not on your skin for very long. That’s why I recommend a gentle balancing cleanser or micellar water for every skin type, morning and night. For those with oily skin, resist the urge to go for anything more aggressive. You might not get that squeaky-clean feeling, but getting rid of every drop of oil on your face can actually trick your skin into thinking it needs to produce more oil. In general, cleansers that form a lather and ones with acne-fighting ingredients like salicylic or glycolic acid are ones that will be more stripping. And you’re going to deal with breakouts in your next step, so hold tight. Get the dirt, oil, and makeup off your face—deal with the rest later. You still with me? Think of it as your active step—this is the step that will clear out pores, minimize fine lines, smooth bumpiness, lighten dark marks, and boost overall glow. While exfoliation may make you think of scrubs, consider swapping yours out for an acid. They can come in liquid form, which is called a toner, in a bottle with a dropper like a serum, and as a thin cream—they’re all acid exfoliators. “But, hey,” you may be thinking, “didn’t you just say to avoid acid?” In cleansers that you wash off - yes. Acid exfoliators are formulated to stay on the skin and absorb, so they’re paired with ingredients that will soothe and hydrate the skin without being too stripping. There are a few different types of acids to be aware of, and you can pick which acid exfoliator is best for you based on your skin type and what you’re looking to treat. AHAs: Best for evening out texture and tone—hyperpigmentation, roughness, and surface scars all benefit from AHA treatment. Look for glycolic, lactic, or mandelic—if your skin is redness-prone, glycolic may be too strong for you. BHAs: If your main concern is congested pores—blackheads, whiteheads, and uneven texture—this is the acid for you. While AHAs work on the surface of the skin, BHAs get inside the pores to dissolve oil from the inside out. They’re also gentler than AHAs, so even sensitive and rosacea-prone skin will take a liking to them. Look for salicylic acid on the label. Azelaic acid: It’s the most gentle exfoliating acid of the bunch, and is great for sensitive, oily skin. Try this one. AHAs + BHAs: Want to even hyperpigmentation while you work on clearing new breakouts? Some products mix acids to get the benefits of both. That’s OK, but be aware that they’ll be more intense—you might want to start with something gentler, and work up. Some great options include Glossier Solution, Dennis Gross Alpha Beta pads, and the cult classic P50. Or use a BHA in the morning and AHA at night. Without getting too technical, acids balance the pH of your skin—when pH is imbalanced, your skin will flush and turn red. That’s why acid exfoliators are applied directly to clean skin, but also why the best way to work an acid—any acid—into your routine is to do so slowly. Start off by using your acid three times a week after cleansing at night, slowly working up to every day and eventually twice a day, morning and night, over the course of a month. You’ll minimize redness and irritation, and avoid a major skin freak out. Let’s set the record straight right here: dry skin and dehydrated skin are different. Dry is a skin type—it means your pores are small, and your skin doesn’t produce much sebum. But anyone can have dehydrated skin—it happens when your skin lacks moisture, not oil. You can tell if you have dehydrated skin by placing a finger from each hand about two inches apart on your forehead, and gently pushing inward. If the skin crinkles like it has a little layer of Saran wrap on it, that’s dehydration. Most people, especially in winter, have dehydrated skin—to rehydrate, look for humectant ingredients, which attract and bind moisture to the skin. Some common ingredients to look for are hyaluronic acid, glycerin, vitamin B5, and aloe. Humectants work best when applied on damp skin, because it gives the molecules water to hold onto. Any mist works—Evian Thermal Water or rosewater from the grocery store work great, and this spray with zinc hydrates and mattifies oily skin. If you have normal to dry skin, try working in a water-based humectant serum or essence. If your skin is oily, look for a gel moisturizer, which will hydrate the skin without feeling too heavy. Here’s a good option, and a drugstore version. Last step! While some moisturizers also include hydrating ingredients, the purpose is fundamentally different. Oil-based ingredients work to seal in the water-based hydrating agent you just added so it doesn’t evaporate. Think of this step as putting on a barrier between your skin and the world. For those with normal to dry skin, your daytime moisturizer should include ingredients like ceramides and light oils. If you have oily skin, skip the oil in the morning, but use it at night—that’s when your skin does the most repair on itself and needs the extra nourishment. Squalane oil mimics your natural sebum, while rose hip oil is ideal for breakout-prone or oily skin. The right night treatment for extremely dry skin includes heavy occlusives like cholesterol and lanolin. Heavier moisturizing agents will help repair your skin’s natural barrier function, which may be compromised if your skin is very dry. As with all new products in your routine, introduce each step one by one, giving your skin about a week to adjust before introducing another. Your skin turns over about every 30 days—that means, after 30 days, you’ll be working with all new skin cells. Nine months gives your skin time to turn over nine times—more than enough time to see a visible difference just from these simple steps alone. By the time wedding day approaches, your skin will be balanced, clear, bright and just right—with no last minute stress. Still shopping for a wedding dress? Come book an appointment with us to see our curated selection of beautiful preowned and sample designer wedding dresses. You never know what you might find!